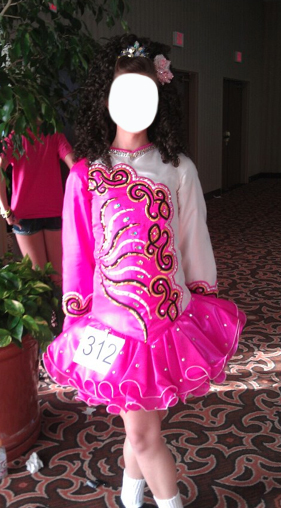 This vibrant pink dress made by Geraldine Taylor of Belfast was made in October of 2012 for a very petite Open Champion U18 dancer who was 5′2″. 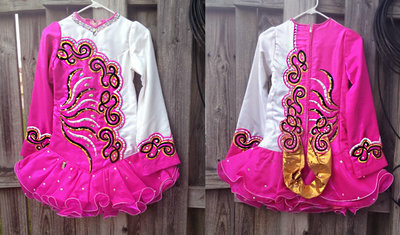 Dress is in excellent condition and has hundreds upon hundreds of AB swarovski crystals. There are bold accents of gold and black which really stand out on stage. Comes with kick pants, matching headband, and flowers to match go with the headband. 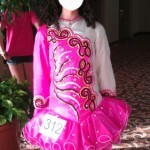 The dress can fit a wide range of ages, as a U12 dancer wore it once when her dress was not yet ready for a feis. Please email for additional pictures and information. VERY willing to negotiate price, eager to sell. Thanks! About 2 Inches let out from zipper, also about 2.25 inches let down.